In this chapter of Corner Stats, let's analyze the turnovers. Welcome back to Corner Stats! During the analysis of some aspects of the Pace, I have mentioned that the turnovers have not always the same value, since some of them do not interrupt the game. In this new post, we analyze this aspect in statistical terms. In order to weigh the lost balls differently, the first thing to do is to identify inactive and active turnovers. With inactive I mean all those lost balls which are followed by an interruption: they can be a traveling violation, a charge foul or other rule violations. Instead, with active I mean all those lost balls that do not interrupt the game: they are basically the opponent’s steals. The active ones can be considered more serious since they offer to the opponents a transition chance. The idea is, therefore, to give more weight to the active lost balls than to the inactive ones. The second step is to understand what weight to give: multiplying the active turnovers by an equal factor for all teams would not be correct because the defensive transition ability of each team would not be considered. For this analysis, we can assume that a transition always comes up after an opponent’s steal: actually, it is not always like that but we can say it in order to simplify the calculation. The transition efficiency depending on the ability of the opposing players but also on the team defensive system. Therefore, the idea is to correlate the amplification factor of the active lost balls with the defensive ability in transition situations. So the next step is to find a statistical value of the defensive transition ability: unfortunately, compared to the past season, several data are no longer available (such as the NBA playtype). To overcome these absences, the most logical method is to divide the allowed transition points with the total ones. The higher will be the ratio, the worse is the defensive ability during the opponent’s fastbreak. Once the relationships have been identified for each team, the percentiles of those data have to be calculated: the percentiles will be our amplification factors. The first term (TO – Opp ST) identifies the inactive turnovers. The second term instead multiplies the active lost balls (the opponents’steals) with the amplification factor: the “k” term is the percentile identified previously. Doing this we take into account the team skills on both sides: there may be teams that tend to lose many balls, but do not pay too much this lack with their excellent defensive reaction. In this case, the value of active lost balls will be high, but it will not be too amplified due to the low value of k. On the other hand, there may be teams that lose a lot of balls and also have a bad transition defense: in this case, the final result will be much higher and worse than other teams. 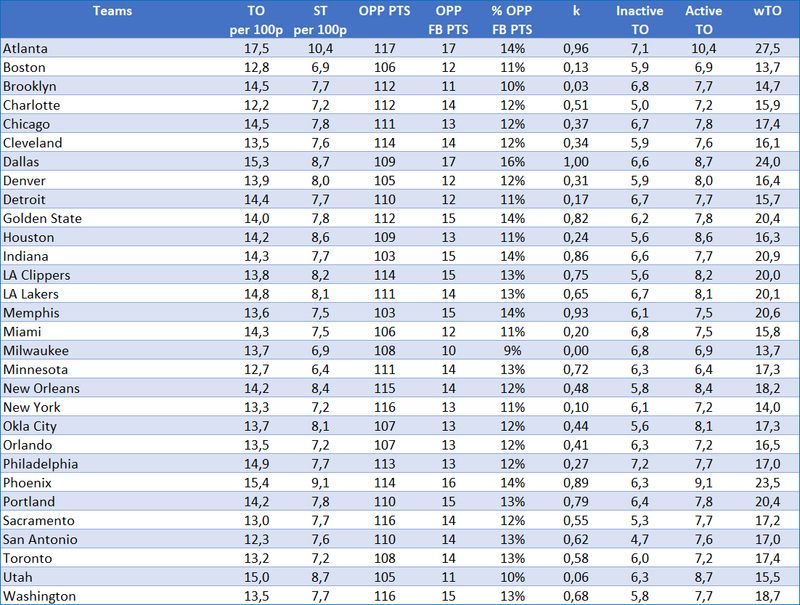 I then performed this calculation for NBA and EuroLeague: here are some charts and tables that show the results obtained. 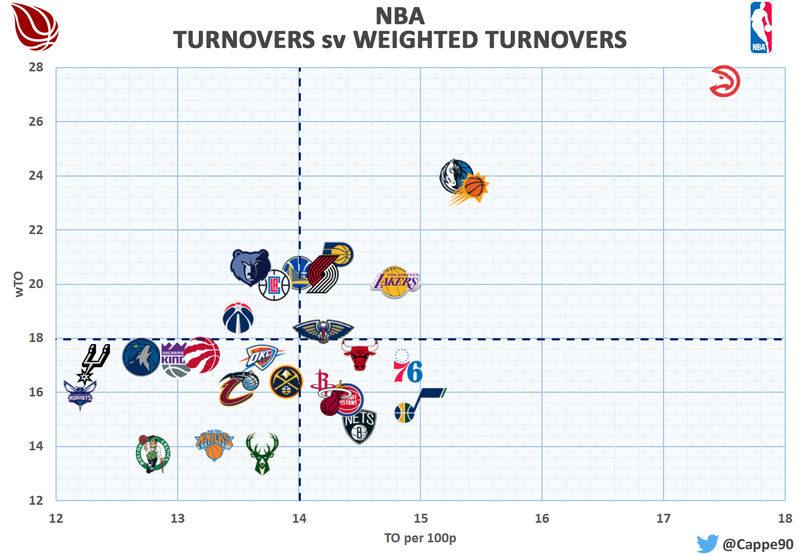 The Zalgiris is the worst in turnovers and is also the worst in the ranking for weighted turnovers. 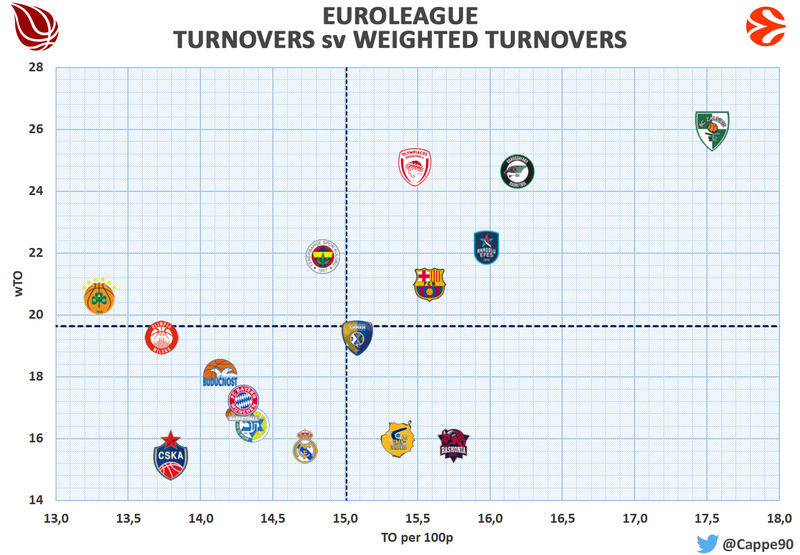 Moving to the left of the chart we can see some differences: for example, with the same number of lost balls, Baskonia and Efes suffer differently the consequences: the Turkish team has a much higher value of wTO, so it means that between the two teams Efes is the one who is more hurt by a lost ball. Even in this case, the worst team in turnovers (Hawks) remains the worst even in the weighted ones but we can find other examples as done with Baskonia and Efes. The weighted lost balls are therefore a good tool for evaluating the weight of each turnover, considering also the defensive skills of the team. The uses of this stat can be many: estimate how much a team is affected by losing balls and analyze the consequence of this aspect; understanding if the opponents’transitions are more influenced by the lost balls or by the defense, trying therefore to improve one or the other aspect; analyze the lost balls of each team considering also other game aspects, which are not covered in the normal stat about turnovers. In the next analysis, they could be useful to deepen some situations.